25 years of a life closes a circle in an instant, this moonlit starry night. Regretfully – or maybe – fortunately – the impressions or images of this night’s moments are not sharable by snapchat, instagram, or the like. At least not with the gear at hand, so words will have to do. It is dark. I am on night watch on a passage from Madeira to Gran Canarias. Las Palmas is some 20 nm ahead. On a calm ocean, Iris is like a train on rails doing 6.5kn of speed from 9kn of headwind. That in itself is better than nice. 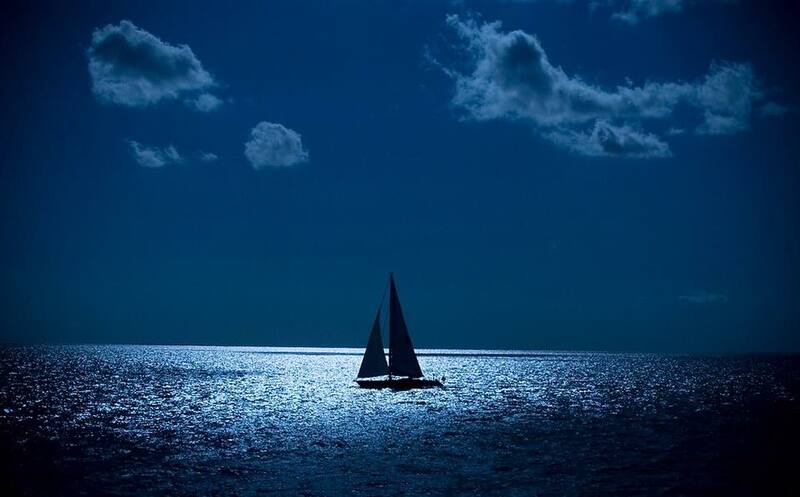 A warm breeze is caressing the sails – and me. Below everything is quiet and dark, apart from a faint glow of the radar scanning the horizon and guarding us and the odd chatter on VHF ch16. Rather than do the usual reading, I decide to just sit outside and experience the night. I have made this landfall before, 25 years ago, at night under similar sailing conditions. That time it was as crew on Serata with my father in law, Bernt. It was his planned long sailing journey. Sometimes we fall lucky and are besieged by a life inspiring moment; the landfall 25 years ago became one of these few rare moments that has the potential to alter the course of ones life – which it did and does. The feeling it created etched itself into my memory. There it had fueled an inspiration to once return on my own keel. Tonight is that night. It is also a night where I am grateful to Bernt for providing that first opportunity to savour ocean passages, and for his willingness to share his voyage. Tonight my thoughts also returns to my great father, Arvid, who was crazily sane enough to provide me with my own dingy complete with outboard engine at the mature age of 7! As a professional mariner, he showed me the “ropes”, instilled a love for the sea, and inspired me to venture beyond the horizon. If not all, so at least the latter, I hope to have embedded in my three lovely daughters. I find myself lucky to share this journey beyond the horizon with a gentle woman that holds many of the same passions – and thinks the best way to fall asleep is by the rocking motions of a boat at anchor. She now sleeps safely below. I wish for this night to never end – and if it became the last, that I would be ready. OK, I admit it. In a moment of weakness, having succumbed to adding an image from the web. Thought it half decently reflected the night.